For the 2002 animatit film, see Ice Age (2002 film). An airtist's impression o ice age Yird at glacial maximum. Based on: Crowley, T.J. (1995). "Ice age terrestrial carbon changes revisited". Global Biogeochemical Cycles. 9 (3): 377–389. Bibcode:1995GBioC...9..377C. doi:10.1029/95GB01107. 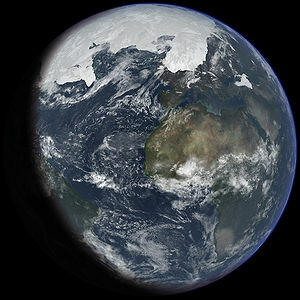 An ice age is a period o lang-term reduction in the temperatur o Yird's surface an atmosphere, resultin in the presence or expansion o continental an polar ice sheets an alpine glaciers. This page wis last eeditit on 16 November 2015, at 17:37.